David Hilbert in in his 1900 address to the Paris International Congress of Mathematicians, listed the Riemann Hypothesis as one of his 23 problems for mathematicians of the twentieth century to work on. 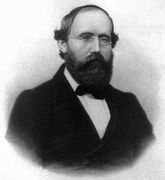 Bernhard Riemann was a German mathematician who made important contributions to geometry, number theory, topology, mathematical physics and the theory of complex variables. Now we find it is up to twenty-first century mathematicians! The Riemann Hypothesis (RH) has been around for more than 140 years. The Riemann hypothesis, proposed by Bernhard Riemann (1859), is a conjecture that the nontrivial zeros of the Riemann zeta function all have real part 1/2. Score well at the end of an important game of cricket. Find an argument for the nonexistence of God that convinces the general public. Be the first man at the top of Mount Everest. Be the first president of the USSR, Great Britain, and Germany. Hardy grew to love the problem. He and Littlewood wrote at least ten papers on the zeta-function.